Definition of NAICS Code 811219: This U.S. industry comprises establishments primarily engaged in repairing and maintaining (without retailing) electronic and precision equipment (except consumer electronics, computers and office machines, and communications equipment). Establishments in this industry repair and maintain equipment, such as medical diagnostic imaging equipment, measuring and surveying instruments, laboratory instruments, and radar and sonar equipment. Repairing communications equipment–are classified in U.S. Industry NAICS 811213, Communication Equipment Repair and Maintenance. 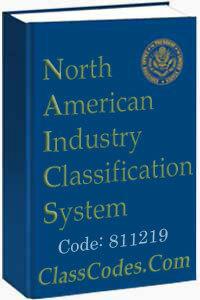 The suggested cross reference guide for NAICS code 811219 is based on our research using the resources cited above.